Orpheum Archtop 837 1950’s Natural – Buy Now! 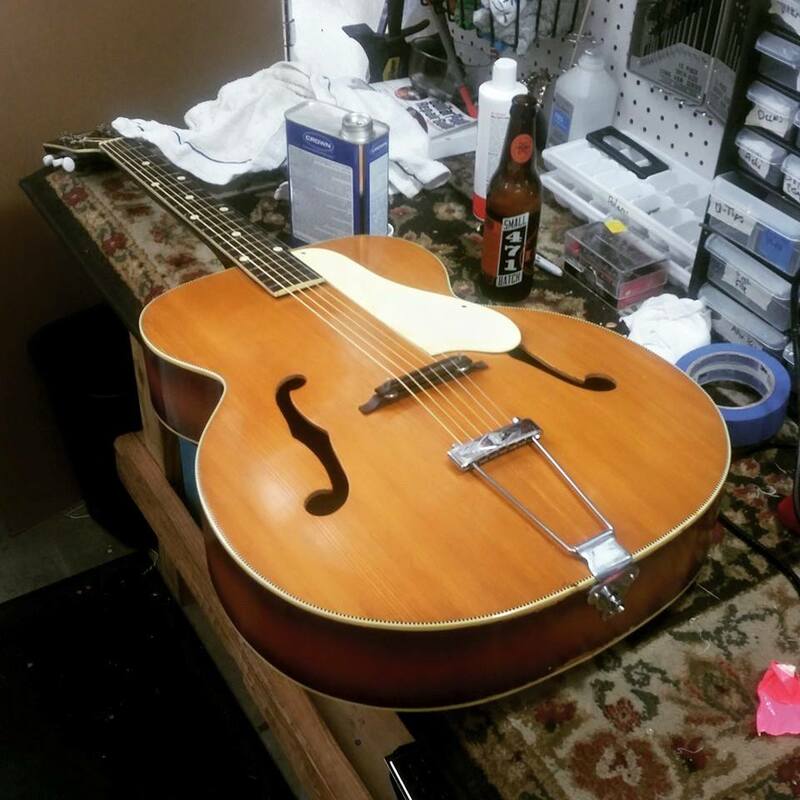 This 1950’s Orpheum 837 archtop has a great cutting sound, a killer look, and is a true vintage player. It’s a tight-waisted jumbo body with original white celluloid pickguard and adjustable rosewood bridge. The neck is in good shape with plenty of wear left in the frets. It has the thick baseball-bat neck profile you expect in a 1950’s Kay-style guitar (Orpheum was made by Kay during the 1950’s), but it’s easy to play all the way up and down the neck. It’s an awesome guitar – buy it here. This Orpheum has striking jumbo pearloid fret markers, with double dots at the 5th and 9th frets, which is a common 1950’s style. Tuners and other hardware are original. The Orpheum 837 is similar to a Kay K42. Orpheums are less common, though (this is the only 837 I’ve ever held). 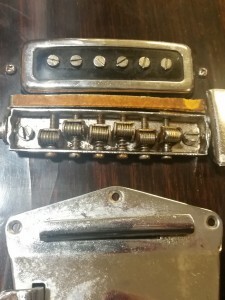 The only non-original piece of hardware is the trapeze tailpiece, which is stickered Gibson and appears to have been added sometime during the 1960’s. A bit of history: Orpheum guitars (and mandolins) were originally a brand of Rettberg and Lange, starting in 1897 when they bought the facilities of New York banjo-maker James H. Buckbee. Orpheum went out of business in 1942, but in 1944 New York’s Maurice Lipsky Music Co. bought the brand and had Orpheum guitars made by Kay, Regal, and others (that period is when this Kay-produced one was made). In the 1960’s Lipsky used the brand on Japanese and European imports and dropped the brand by 1972. 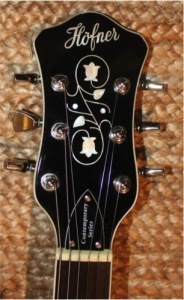 Between 2001 and 2006, Tacoma Guitars made a series of Orpheum guitars. It’s in good shape given its age. 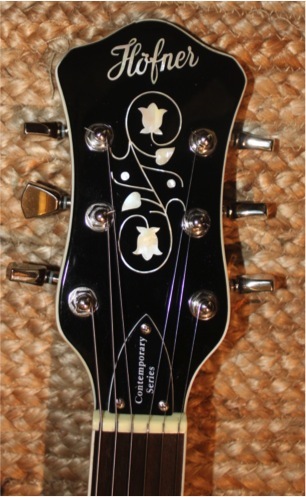 There’s some wear around the binding, especially on the back, and on the headstock, as shown in the photos. No case, although I’ve found that it fits in a dreadnought gigbag. Most importantly, it plays well, to the point that I haven’t been able to put it down around the house and even used it for a few songs at a recent gig. Yep, this one needs to be played. If you’re looking for a classic Kay-style 1950’s guitar with great looks, an unusual brand, great sound, and mojo to spare, this is your guitar! Buy this Orpheum Archtop Model 837 now! 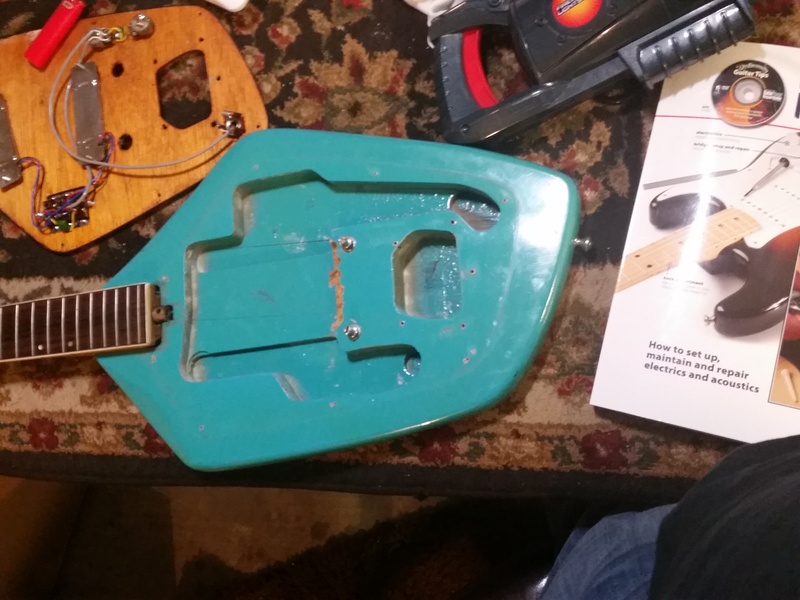 When I was working on a 1967 Telestar T2 Teardrop recently, I noticed that that both pickups had become microphonic. What does that mean? The pickups had become ultra-sensitive, squealing with feedback and creating sounds at the smallest tap on the guitar. The sensitivity is caused by windings coming loose, so that they can slide up and down on the polepieces. Each shift in winding position causes sound and/or feedback by induction, just as the magnetic coil inside a cardioid microphone does. 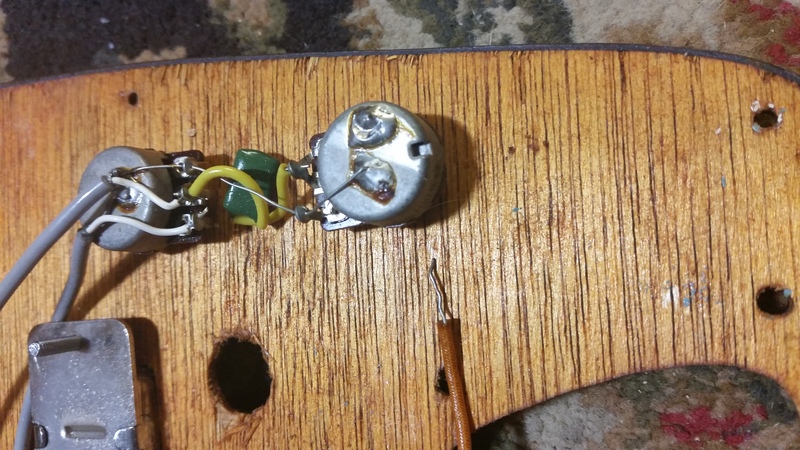 In an extreme case, a microphonic pickup becomes a rudimentary microphone, so that you can speak into the pickup and hear your distorted voice come through the amp. Kind of cool, but after the novelty of Darth Vader impressions wears off, you might want to fix it. Melt 20% beeswax and 80% paraffin, using a hot plate or crock pot set to “Low.” (You’re shooting for 160-180 degrees fahrenheit, and you shouldn’t do this on a gas range or with flame nearby as wax vapors are flammable). I use a cheap crock pot lined with aluminum foil. You can get the beeswax and paraffin at a Michael’s or other hobby store, and groceries sell paraffin for canning, too. 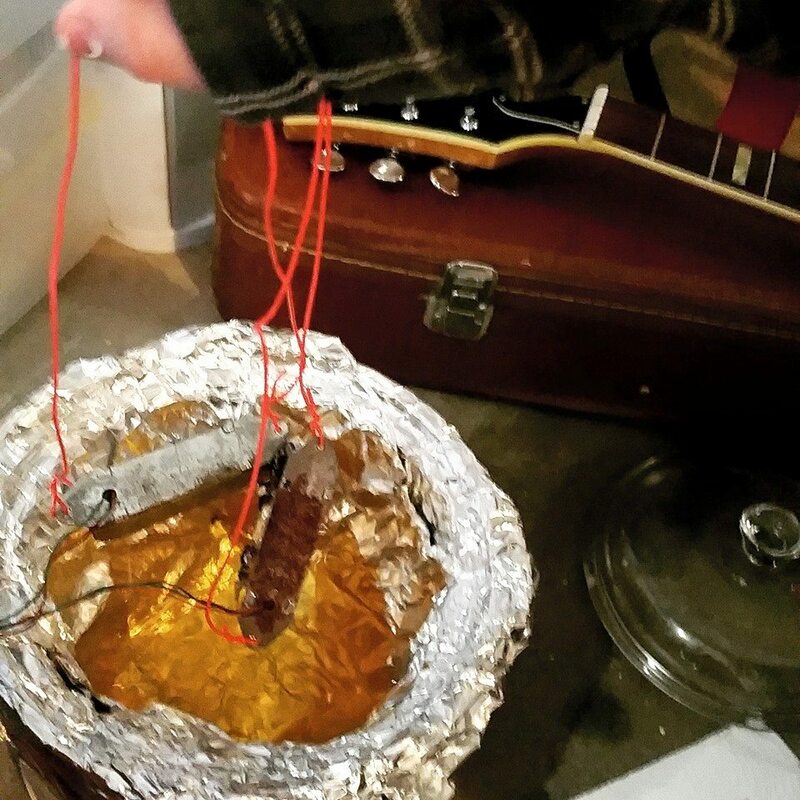 Lower each pickup into the melted wax for 15-20 minutes, suspending it so that it doesn’t touch the bottom or sides. Rock it from time to time so that it emits bubbles – this lets you know that the wax is penetrating all cavities. Pull back out and clean off the excess wax. Reinstall the pickup. In most cases you’ll find that the microphonics are gone, leaving a great single-coil tone! It may be a 1960’s survivor and a relic of the greatest Weird Guitar period in history, but the most impressive thing about this Telestar T2 Teardrop is how well it plays. It has a rock-solid neck and I’ve carefully set it up for blazingly low action and perfect intonation. It’s perfect for the guitarist who wants great playability and tone, a retro look, and a groovy sixties vibe from the great Japanese Guitar boom. Buy the Telestar T2 Teardrop here. Unlike many guitars from its era, it plays well all up and down the 21-fret neck. The neck is straight and true, and the truss rod works just fine. 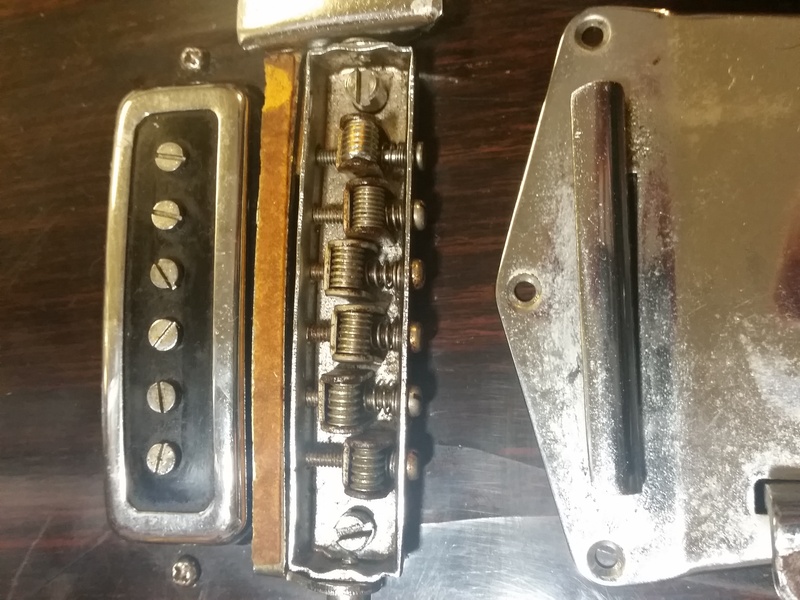 Electronics are stock and I’ve wax-potted the original single-coil pickups to retain the original sound while avoiding the screechy microphonics that are common to Japanese pickups from that era. Action is low and even, and intonation is accurate all the way up the 24″ scale (same as a vintage Mustang, or Brian May’s Red Special for that matter). The Telestar T2 Teardrop is as sonically versatile as it is cool. The neck pickup alone delivers a classic 60’s mellow jangle, and with both pickups wide open and a touch of distortion it snarls and growls beautifully. Take this one on stage and you’ll sound good and get noticed. There’s no case, as it was lost on Ken Kesey’s Merry Prankster bus (but any standard gigbag will fit). All those details are shown in the photos, and none of them can be seen from the audience or detract from playability. In short, this is a player’s guitar, not a collector’s piece to hang on a wall. The history and scars add to the soul and uniqueness of this rare bird. This guitar lived through the 60’s and might even remember some of it, but unlike your ex-hippie uncle, it never cut its hair and went back to the corporate world. Want a vintage vibe and sound? 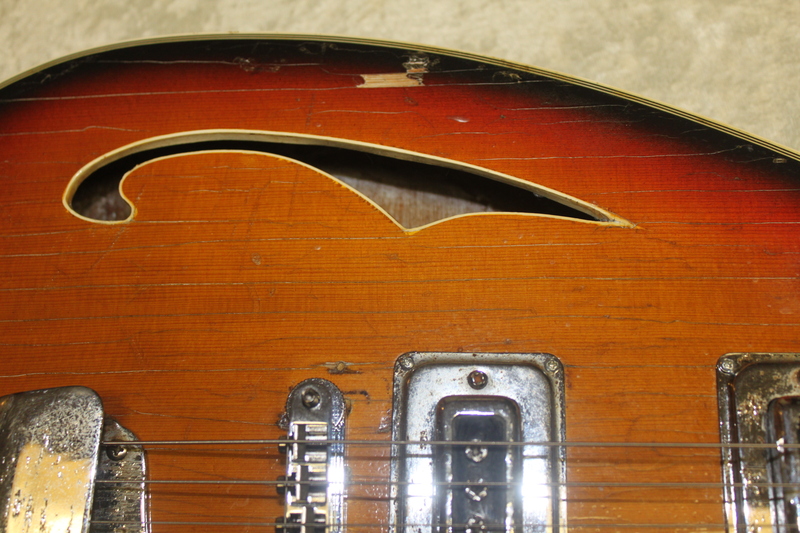 Want to own a piece of guitar-boom history? Want something more “alternative” than a made-in-Mexico Relic Pawnshop Mustang reissue? This is your guitar. 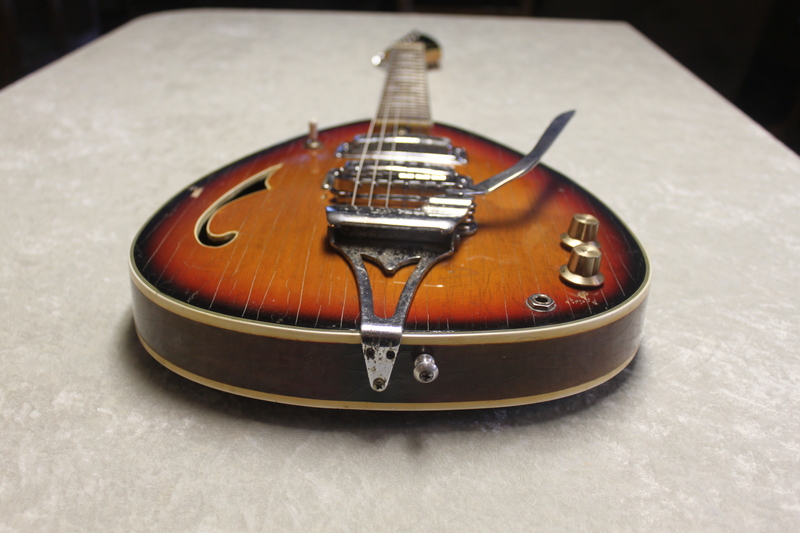 Buy the Telestar T2 Teardrop here on Reverb.com. 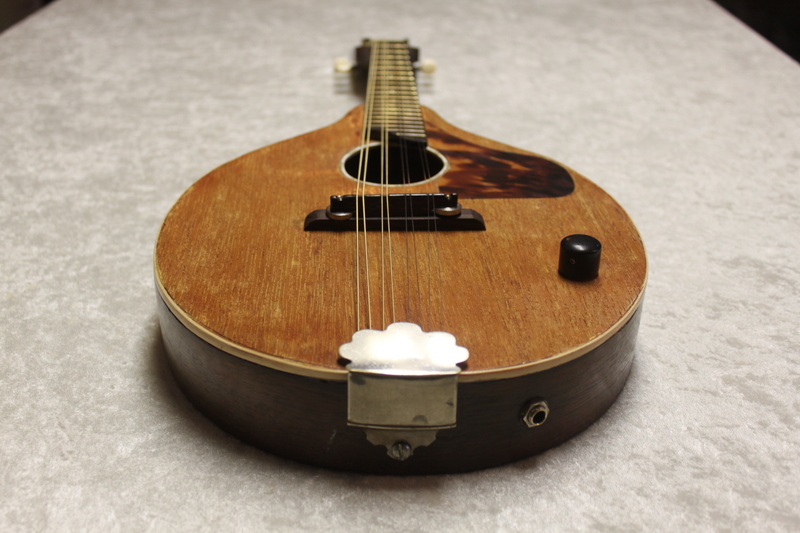 This is a rare find – a 1930’s vintage Kalamazoo flat-top mandolin, still in shape to play well. 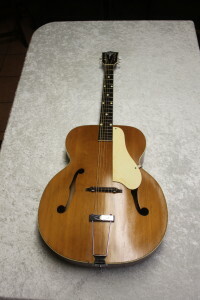 Kalamazoos were made by Gibson, so this is a chance to own a playable 85-year-old piece of history at an affordable price. Buy the Kalamazoo Flat-Top Mandolin by Gibson here. As you can see from the photos, it has the wear and tear that you might expect of an 85-year-old instrument that’s been played rather then being kept in a museum. The shellac finish is worn and is worn through in places. Although it plays well for the first 12 frets, it has a slight ski jump at the neck joint that prevents it from playing well above the 13th fret on the G, D, and A strings. However, everything from the first to the 12th fret rings cleanly without a hint of buzz. So I’ve chosen to leave it in its current condition, highly playable for all but the demanding mandolin virtuoso, to avoid tampering with the neck of a very vintage instrument. It has been modified a few times throughout its history. A previous owner installed a pickup; not a modern one from what I can tell, but probably not 1930’s vintage either. The pickup is loud and clean, giving you the chance to play an electrified vintage mandolin without feeling guilty about modifying it. At some point many years ago a previous owner installed additional bracing as the top was beginning to buckle. 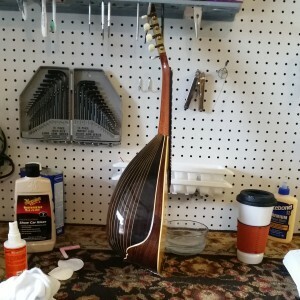 The bracing wasn’t done by a professional luthier from the looks of it, and was done with Titebond rather than hide glue, but it is functional and successfully stabilized the instrument. The sound remains quite bright and strong, despite the additional bracing. I had to do a couple of small repairs to it to get it ready for you to play. The fretboard was separating from the neck in the upper ranges and the rosette was coming loose. I reglued both with period-correct hot hide glue, which transfers the sound better than modern glues. The bottom part of the rosewood bridge was broken when I got it, so I replaced it with an adjustable rosewood bridge modified to fit on a flat-top. Not quite period, but more functional. 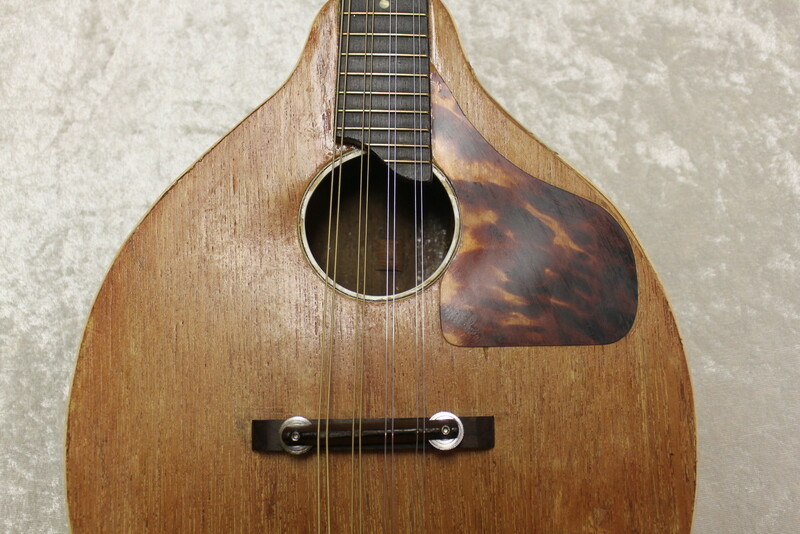 1930’s Kalamazoo Flat-Top Mandolin by Gibson – Buy Now! It comes with a rather unique hand-built coffin case that a previous owner presumably made. It’s rather heavy and certainly not original, but since it’s been part of this mandolin’s journey, I’m including it. (If you’d rather not have the case, let me know and I can reduce the shipping cost by $15 or so; it is a heavy case). These are very rarely seen in collector’s condition, and when they are, they’re as pricey as you might expect. This is a chance to own a piece of history in playing condition, not just a wall hanger, at an affordable price. A must for the Gibson/Kalamazoo/mandolin history buff, or for the bluegrass picker who wants an instrument his grandpappy could’ve played. Buy the Kalamazoo Flat-Top Mandolin by Gibson here on Reverb.com. Problem: The fretboard is separating from this 1929 Kalamazoo mandolin, and the rosette is separating from the soundhole as well.Both need to be removed and properly reglued with hide glue. But how to remove the old glue so that I can separate the parts? Solution: a Starbucks home espresso machine from a garage sale. Works like a charm. With steam, a palette knife, and some elbow grease, it’s suddenly easy to remove the old glue. And hey – if I add some tubing and a needle, I’ll have a neck steamer. I’m working on a 1967 Domino Californian right now. 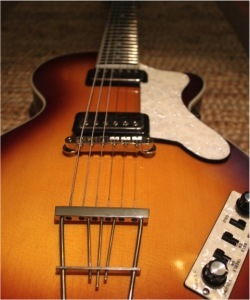 Interesting vintage Japanese guitar, made by Kawai (one of the four major Japanese OEMs). As you can see from the body shape, it’s based on the Vox Phantom. There’s a good deal more grassroots innovation in the Domino Californian than I’d expect to find in a Vox Phantom, though. In fact, there are things that a redneck engineer would be proud of. Case in point: the bridge saddles. Take a close look, and you’ll notice something interesting. They’re not carefully machined, purpose-built saddles as you might expect to find on even a cheap Fender. They’re nothing more than short lengths cut from threaded rods or, more likely, spare bolts. Notice that they don’t even all have the same thread. You could call it cheap, low-rent guitar manufacture. Or you could call it a creative recycling of existing materials. Either would be accurate and accounts for the 1960’s-wood-paneling pickguard as well. The makeshift bridge saddles actually work pretty well. Believe it or not, I have the action and intonation set spot-on now. After setting that and fixing a broken ground wire (photo to the left), it plays easily and sounds great now. I’m waiting on a replacement tremolo arm and a couple of knobs, then I’ll have this one up for sale on the Vintage Soul Guitars Reverb.com store. This unusual guitar is a prototypical 1980’s instrument designed for shredding, with a flat-radius fingerboard, an Ibanez Pro Rock’R tremolo featuring individually adjustable saddles, and a wide range of possible pickup combinations between the two single-coils and the humbucker in the bridge position. It’s got killer sustain because of the combination of the solid alder body, the high-mass tremolo block, and the unusual floating “tub” pickup mounts. Usually I call them guitars. This one…it’s an axe. No two ways about it. And although there are a number of dings in the finish and it’s far from mint condition, the original Polar White has aged to a really nice cream color. Altogether a beautiful instrument with a lot of character. It’s also a bit of a “missing link” to later Ibanez models, as it was only made in 1985 (details on the full Pro Line 1985 lineup here). So they’re pretty hard to find, and I was excited to come across one. This one needed a bit of work. A few parts were missing. It rocks just fine without the back plate to cover the tremolo cavity and the truss rod cover…good thing, since replacement parts for them would be almost impossible to find. But it was also missing the Top Lok system, an above-the-nut lock with an unusual shape. Without it, it would be hard to take full advantage of the otherwise-outstanding Pro Rock’R tremolo. And the Top Lok hasn’t been made since 1985, so there’s no chance of finding a replacement. I took the advice of a friend (thanks, Ken!) and replaced it with a Kahler above-the-nut lock. While it didn’t fully replicate the unusual staggered shape of the Top Lok, a 1 5/8″ Kahler piece fit nearly perfectly, requiring two holes to be drilled and no other alterations. Beyond that, this was mostly a standard clean-and-setup job. I pulled all the metal parts off and degreased them with naphtha, than bathed them with a machine-oil-and-naphtha mix to prevent any further corrosion. I cleaned pots, switches, and contacts to eliminate any extra noise. Neck angle was fine. I cleaned everything inside and out, then put it back together, dropped the action a bit lower than it had been, set pickup height to 1/8 on bass and 3/16 on treble, and set the intonation with a set of 9’s. Finally, I used some McGuiar’s M7 Show Car Glaze to hand-buff out some micro-scratches, then polished with Gibson guitar polish. Now it shines like a new axe and rocks like Dokken. 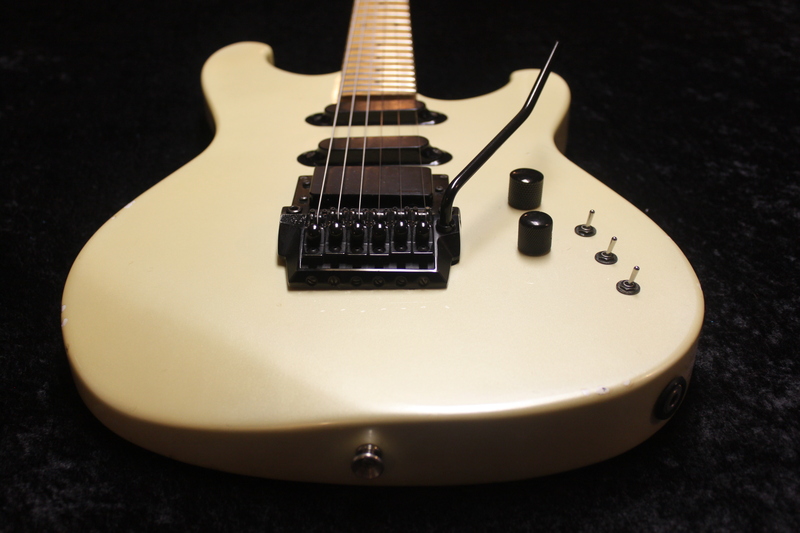 It’s up for sale now on Reverb.com, so check out the 1985 Ibanez Pro-line PR1550 here. If it’s sold already, there’s probably something else in the Vintage Soul Guitars Reverb.com store. Here’s a good repair procedure to document, as used on a mandolin from the personal collection. My father had a friend bring this mandolin back from a trip to Italy in the 1960’s, and gave it to my mother as a gift. It’s beautiful piece with an interesting Asian-inspired pickguard and a bowl back (as we say in Texas, a “tater bug mandolin.”) It hadn’t been played for many years, and consequently the fretboard had dried out quite a bit. 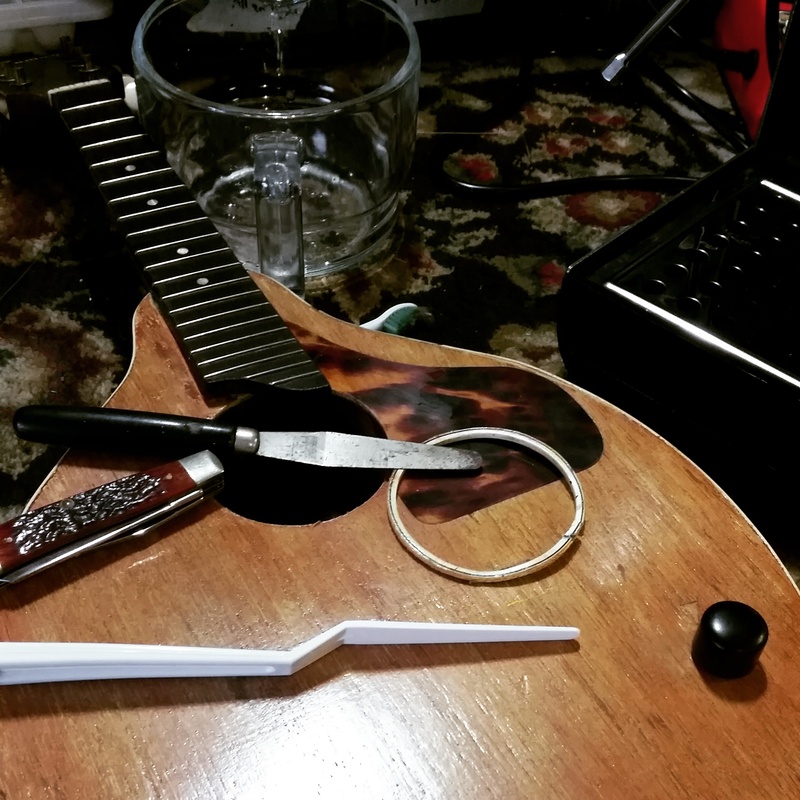 And – details later – it led me to learn a trick for reseating loose frets. 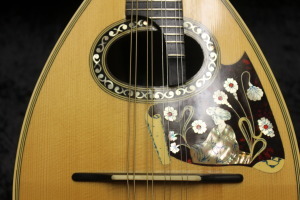 The mandolin had a problem getting past the 12th fret, to the point that the octave note simply disappeared and sounded the same as the 13th fret. We were visiting Springfield, Missouri at the time, so I brought it to Tom Wittrock’s shop, Third Eye Music. At first I thought the frets might need dressing, but Tom pointed out that the 12th (and 13th and 14th) frets were rising up from the fretboard. This can happen due to the drying of the wood as an instrument ages. Filing the frets, therefore, is not the right approach at all. Refretting the instrument is an option, but an expensive one. 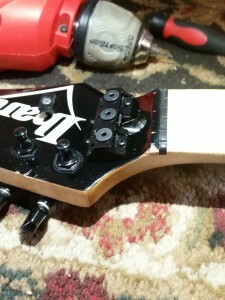 Tape carefully around the fret – both on the fingerboard and neck – with electrician’s tape. Masking tape would probably work as well, but you’ll be using superglue, and I wanted to make sure I kept it away from the wood and finish. Superglue sticks to electrician’s tape like crazy, making it my preferred masking tape for this purpose. Use a sharpened toothpick to flow superglue down into the space between the fret and the wood of the neck. For this purpose you’ll do best with a thin, quick-curing superglue like Bob Smith 101 Insta-cure. Using a wooden dowel or small block (in this case, a leg of a wooden clothespin), press the fret back into place hard and hold it there. Clamping might be ideal, but that’s tricky at the neckjoint. So I held it down for about a three-minute song. Repeat for other offending frets. Remember, a lot of times fixing a fret, whether by filing or reseating, uncovers problems with neighboring frets. I kept acetone on hand as a nuclear option, but didn’t need it – the superglue stayed under control. Acetone will remove finishes and leave you with a refinishing job. 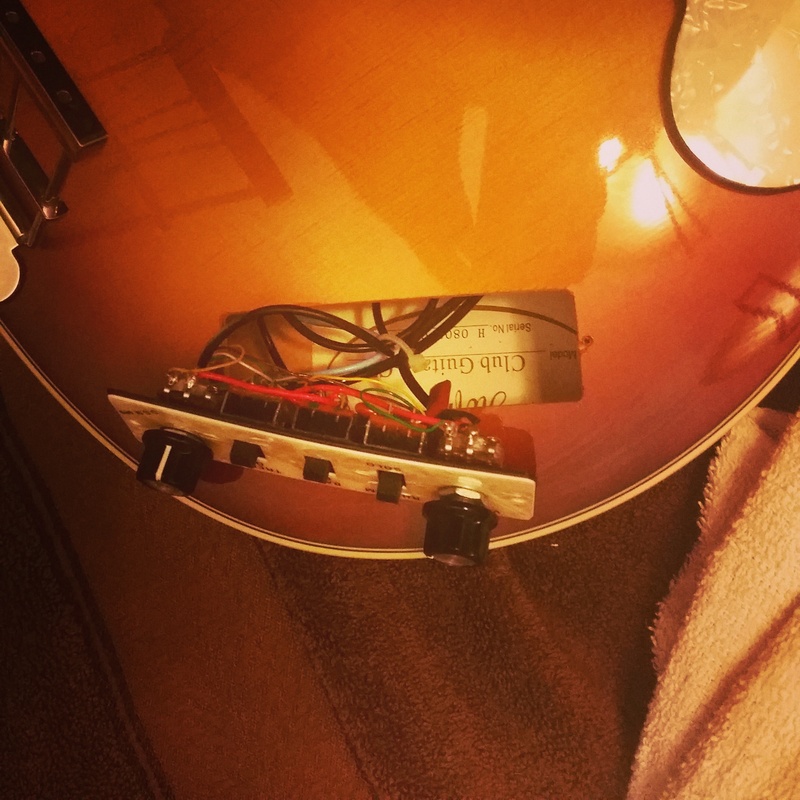 What if you’re trying this hack and something goes wrong and you need to release the fret? 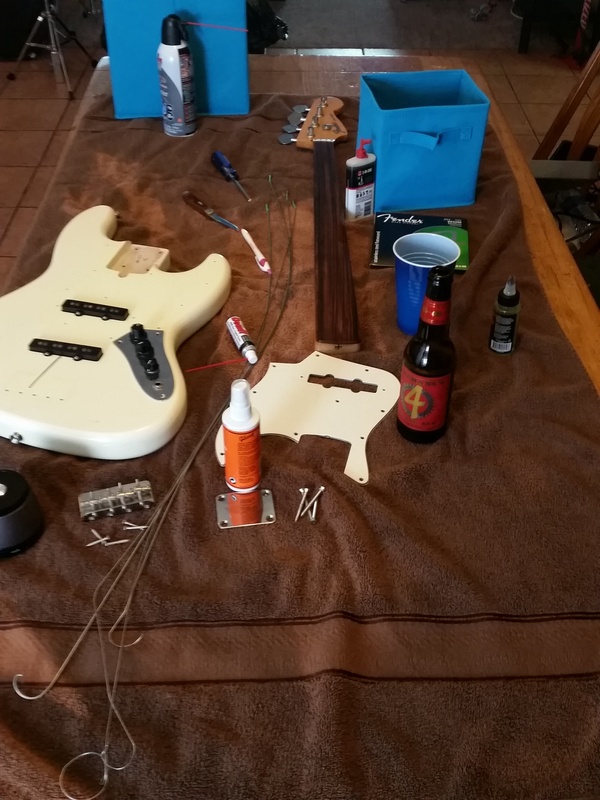 I haven’t had to do it, but just heat the fret with a soldering iron. The superglue will release and the fret will pop back up, so you can try it again. As it turned out, I didn’t have to try it again. The frets stayed down securely and all notes were restored. The mandolin now rings clearly up to the highest frets. The fingerboard was incredibly dry from not having been played for years, but a couple treatments with F-One fretboard oil restored it nicely. Why two treatments? When the wood gets dry enough, it can take more than one treatment to fully penetrate. 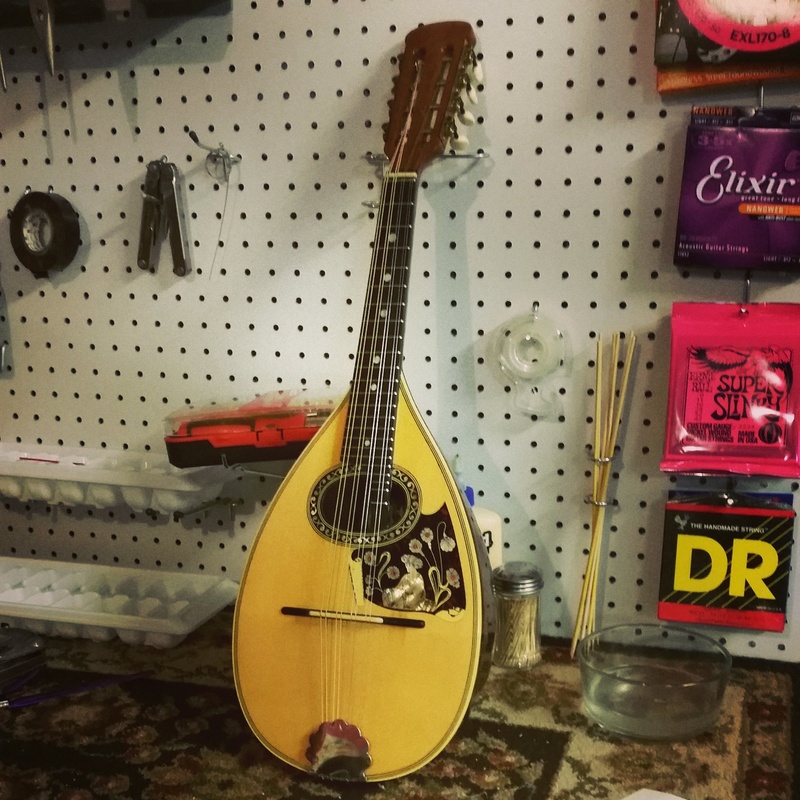 The mandolin was in exquisite shape for a fifty-year-old instrument – no microscratches – so a simple polish out with Gibson guitar polish brought it back to an unbelievable shine. I’m not much of a mandolinist, but it looks great on my office wall. And it sounds amazingly good on a mandolin-driven take on Iggy Pop’s version of “Louie Louie.” (Really). This six-string Hofner CT Club 2009 in Antique Sunburst is a true “closet guitar.” A close associate of one of Austin’s premier blues and rock singers bought it new, hoping to start performing. But other priorities came up, as they often do. The famous behaviorist Pavlov conditioned Russian dogs to, when hearing the word “Hofner”, respond with “Beatle bass.” OK, that wasn’t Pavlov, that was Paul McCartney, but my point stands. Say “Hofner to any Russian dog, and the dog will respond “Beatle bass.” But Hofner makes more than basses, as this beautiful little six-string makes clear. The hollow mini-Les-Paul body is light and resonant, and the pearl appointments and headstock inlays sparkle. Although it’s a new made-in-China model, they’ve done a great job of retaining a vintage look and feel, right down to the hard-to-figure-out Veg-O-Matic switching. 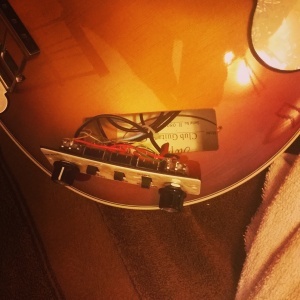 Bass and Treble switches off: both pickups are engaged. 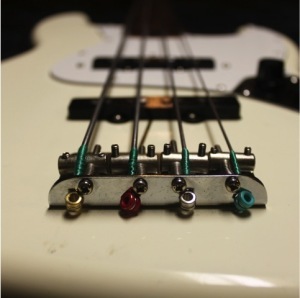 Bass on, Treble off: neck pickup ONLY is engaged. Bass off, Treble on: bridge pickup ONLY is engaged. Bass on, Treble on: NEITHER pickup is engaged. Odd. But that’s the way these are wired. So to rock out with both pickups, turn both switches off. In investigating the switching I pulled the electronics plate, which let me verify the serial number. On these guitars, it’s inside the body cavity, so that’s the only way to find it. While there, I cleaned the contacts and blew out the body cavity, because who knows when it’ll be opened up again? It still needed a good setup, so I strung it up with some Ernie Ball 9’s and started tweaking. 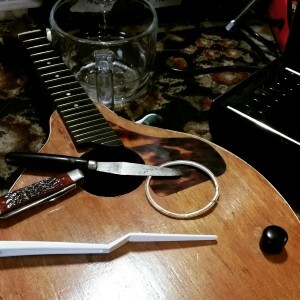 When capoed at the first fret (to rule out anything related to the nut), the action was higher than it needed to be, when measured against the string height guides in Dan Erlewine’s Guitar Repair book. Neck relief was about right, though. So I dropped the strings at the bridge, using the wheel-style adjustments, and was able to get it lower than factory specs while still avoiding any buzz. I dropped the pickups a tad to accommodate the lower action, as pickups too close to the strings can muddy the sound. I used the standard Strat setup of keeping the strings (when fretted at the last fret) about 1/8 above the strings on the bass side, and about 3/32 on the treble side. It can be hard to see the measurement, so sometimes I’ll just grab a 1/8 or 3/32 Allen wrench, slide it between string and pickup, and adjust the pickup down until I feel it touch. Final touch was to polish it to a shine with Gibson guitar polish (oh, and before restringing I nourished the fretboard with F-One fretboard oil – that can make a huge difference in the feel). I was blown away when I plugged it in. Played clean with a touch of delay, it had a Rickenbacker-ish jangle. But add some distortion and light both of the mini-humbuckers up, and the tone became an aggressive snarl, like an angry small dog. Lots of fun to play. I listed the Hofner CT Club in the Vintage Soul Store on Reverb.com and it promptly sold to Jonah Byrd of Jigsaw Soul. The word “eclectic” is overused, but it really applies to his music. So we’ve got a happy ending: the guitar’s out of the closet and in the hands of a musician for whom it’s a perfect fit! A bit of Jigsaw Soul’s music is below. This one’s been hanging out in a log cabin in the Texas hill country for the last ten years. For real. The owner was a guitarist, not a bassist, so he only used it occasionally. 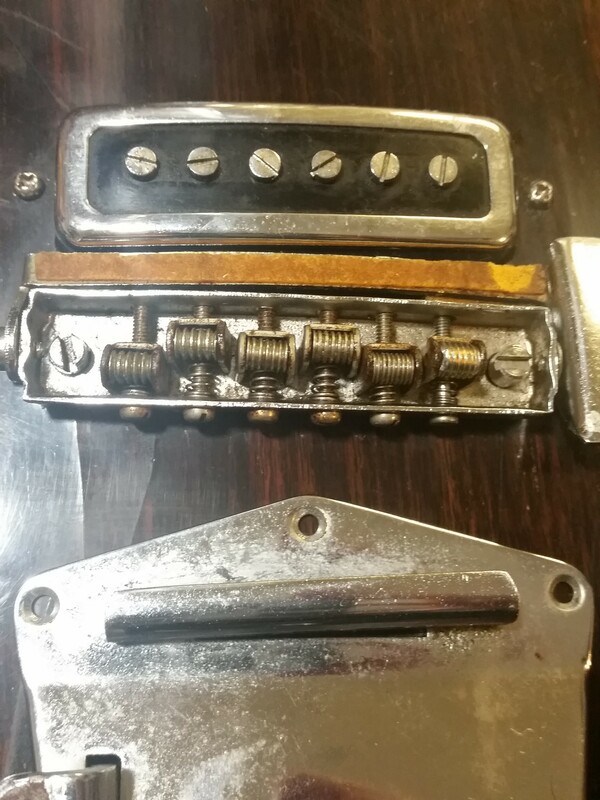 The original owner may have played it a bit more, as it has a few dings and light buckle rash, but overall it was in exceptional condition for a 30-year-old instrument. Bridge and pickup covers were missing. Easy parts to add back if desired, but most players take them off anyway. So I left it as is in that regard. Side note: the serial number tells me that this one was made by FujiGen. From what I’ve read, they made some of the best Japanese Fenders. Between this bass and my similar-vintage Precision, also FujiGen, I’m inclined to agree. Both are outstanding instruments that outplay most American-made Fenders. That said, it did need a bit of cleaning. 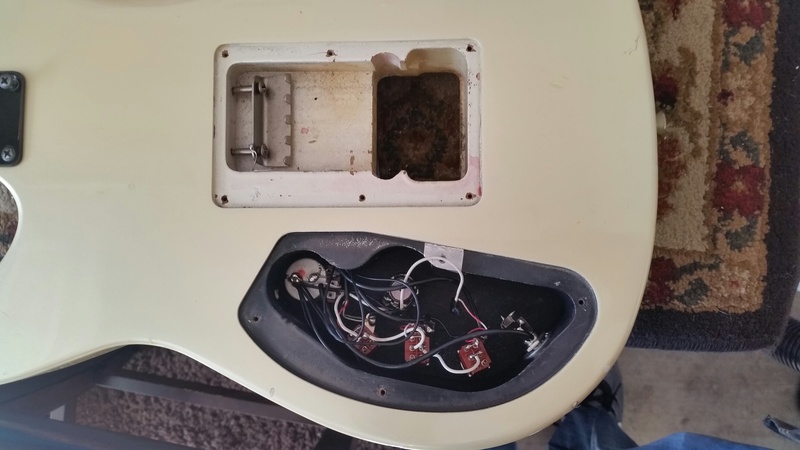 I pulled the neck, bridge, pickguard, and electronics plate off to clean and degrease, then gave the metal parts a dip in a naphtha/machine oil mixture to reduce corrosion. 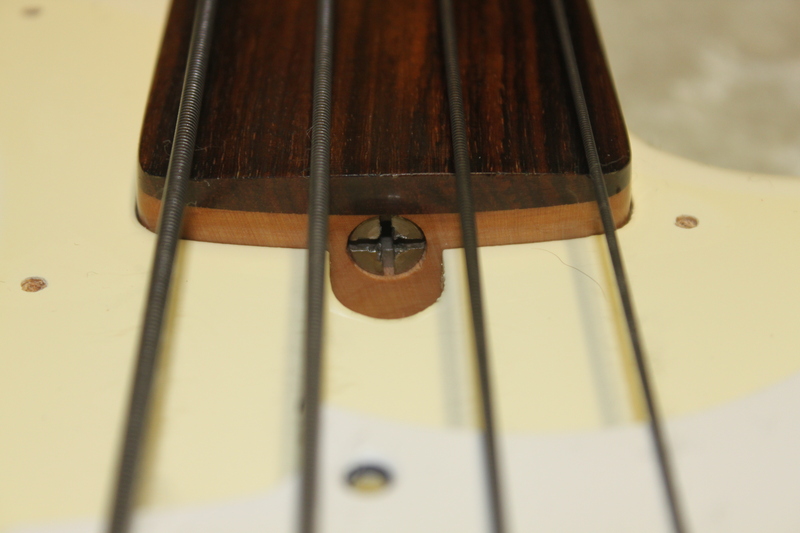 The fingerboard was in outstanding shape for a fretless of that vintage, but was still dry and required oiling and conditioning with F-One fretboard oil. With that done, I reassembled it. Worth noting that all screws, bridge saddles, etc were clearly original. Given the body wear, I used a bit of McGuiar’s Car Show Glaze and hand-buffed it to bring out the shine on the Olympic White finish. Gibson guitar polish finished the job (I’m switching to StewMac Preservation Polish, but using up the last of the Gibson polish first). Whatever polishes you use, make sure they’re silicon-free, as any silicon can complicate future finish fixes. I then strung it up with Fender flatwounds, .055 – .105, and pretended I was playing upright for a bit. It really evoked an upright sound, but with that warm midrange the Jazz pickups bring out. Drive it a bit, and you quickly achieve that wooly Jaco Pastorius tone. I then listed the fretless 1984 Fender Jazz Bass on Reverb.com. It sold recently and shipped out to New Jersey. But I have other vintage guitars for sale on my Reverb.com store, so check them out.